Keiryu Rigs give you hook, line and sinker - and markers - ready to go. Each package has two fully rigged lines, two extra snelled hooks and six split shot. The package indicates that the rigs are intended for 4.5m rods. The line is about 1' longer than a 4.5m rod, so I think it would work quite well for 5.3-5.4m rods as well. To use these rigs, tie an overhand knot in lillian (which I take out at the end of the day when I disassemble the rod to let it dry overnight). Attach the line to the lillian with a girth hitch as you would a furled line. You can adjust the size of the loop in the end of the tenjo line (the bumpy yellow portion of the line) by pulling on the tag end to slide the slip knot. The line is bumpy enough that the slip knot will stay where you leave it and the size of the loop will not change. If you slide the slip know all the way from one end to the other, you can adjust the overall length of the line by about a foot. When the loop in the tenjo line is as large as it will go, you will still use a girth hitch to attach the line to the lillian. It's just that the loop will be much larger than you are used to. Since you can adjust the overall length of the line by about a foot by changing the size of the loop in the tenjo line (for example 14' and 13'), if you shorten one of the lines provided by two feet, cutting just above the rubber O ring and making sure the yarn markers are above your second cut, you would have two lines that together would give you three feet of total length adjustment (one line that is 11' or 12', and one that is 13' or 14'). The markers can be moved up or down the line. Space them a few inches apart, with the lowest one above the water's surface when your hook is at the depth you want. Add a split shot (two if the water is deep and the current is swift) perhaps 8" above the hook. The packages come from Japan with lead shot. It is illegal to sell lead shot in New York, so I replace the lead shot that came with the rigs with Dinsmore's Lead Free BB shot. 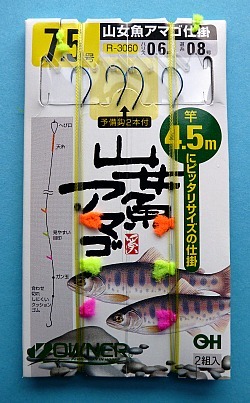 The back of the package suggests either a pair of salmon eggs, a small worm or a nymph taken from under a rock on the stream you are fishing. Meal worms and wax worms work well also. Please note: The Keiryu Rigs use size .6 line, which is stronger than recommended for the Suntech ZPRO and Kurenai, the Nissin Air Stage seiryu rods and the Nissin 2-Way 450ZX soft.